I have spent christmas away from my parents and my sister before. I call that spending christmas away from my family, but that’s not entirely true. I was with my Nonna, great aunt and our extended family, but it wasn’t the same. When I was little christmas was one of the most special days of the year, sitting along side easter and my birthday as the easy top three! It was the day that my Nonna and Nonno would drive down from their house in Rye – which was a big deal as my Nonna hated driving and this was their one exception every year! They as well as my grandma, uncle and aunt, zia and zio and cousin would all get together and we would do christmas together. This is my perfect christmas, all of us together. This is the imagine I remember of my child hood christmas. Unfortunately as I grew up things changed. I remember a conversation with my grandmother one night on the couch at her place during my time with her after my sister had gone to sleep and I asked her about whether or not santa clause was real, confronting her with my questions. [Spoiler alert if you believe in Santa stop reading now!!] She gracefully broke the news to me in a way that maintained my love for the holiday whilst confirming that a big fat man from the North Pole did not slide down my chimney on the evening of the 24th of December each year, and that more than likely my mother or father were responsible for the teeth marks in the carrots we left by the fire place for the reindeer. This was then backed up by my mother shortly after telling me that if I spoiled it for my sister or no longer believed then I would no longer be getting presents. To this day my sister and I avidly maintain our belief in Santa Clause. Anywho! >This part’s depressing so I’ll say it fast< Grandparents die, family members move away and it was no longer the big family affair that I cherished as a child. Christmas changed. I grew up. We started alternating christmas between Melbourne and Canberra as we travelled to see my aunt and uncle at “The nation’s capital”… (seriously need a rolling eye emoji right about here). We would also spend christmas day with family friends which we regard as the family we choose. Literally we have grown up with them and lived with them while our parents were away, they are family. I was also lucky enough to experience the big family christmas for a few years with my then boyfriend as he had an enormous family. I loved it. Especially with little kids around who completely believed in Santa Clause, the Santa suit made an appearence every time! It was always a fantastic day getting to spend it with not only my family in Canberra a few days early or a few days late, my immediate family and family friends on the day and then his family later in the day as well. My point is my christmas changed. Change is normal. It is a part of life and we have to accept that, I did. It might be sad but its inevitable. So this year living in the Netherlands from August to January meant I was not going to be home for christmas. People would ask us (Australians), assuming we would go home just like everyone else does, but our obvious response was that it was too far and too expensive to justify going home and then returning. So this was our situation. Some went home, some had family come to them, and the rest of us well the choice was ours. My options? #1 I could stay in Leiden with people who had their families their and be reminded that I wasn’t with mine or feel like I was imposing on theirs. #2 I could go to my family in Italy and have another christmas with them, but having done that once already and last time with my Nonna I decided that I didn’t want to do that especially without her there this time. #3 Do something else…but what? So it occurred to me, where better to spend christmas than the heart of christmas itself? Where it originated from, the heart of the catholic church, Rome! Additionally if I was to look for one thing that was omnipresent every single christmas it wasn’t my family, or my house, or the food…it was church. Every year on christmas I go to church. When I was younger we would be part of the parish nativity play at St. Francis Xavier, I was an angel and a shepherd and I remember wearing my mothers communion dress as the angel and a costume made by my grandmother as a shepherd. Although I didn’t always enjoy it and it may not have been my choice I always went. It made my mother happy and I didn’t mind going so I went. I even kind of liked it as I got older and started to listen to what the priest would say. His words at St. Annes midnight mass were not ultra conservative. Instead he spoke of joy and life and diversity and love. I was constantly being educated and exposed to differences, experiencing a broader understanding of christmas. So this year I decided back in mid October that I wanted to go to Rome. Googling it I realised that my timing could not have been better as applications for tickets were due on the 24th of October which was in a weeks time. So I filled out my application and emailed it to my cousin in Italy to fax off the Vatican. Two weeks later a letter from the Prefettura Casa Pontificia arrived in my letterbox confirming that their would be a ticket reserved in my name for me to pick up a day or two before Christmas Eve. Having bought my ticket and splurged booking a very nice central BnB I was all set! When I told people they were surprised. I’ll be honest a part of me was worried about being judged or them thinking it was weird and overly Catholic of me – I shouldn’t have cared, and to anyone who did think it was lame I had no problem defending my choice. To my surprise quite a few people were very understanding and excited for me. There seemed to be a general consensus of how incredible and unique this experience would be. More than once I heard “You wouldn’t even need to be Catholic to appreciate the spiritual impact a gathering of that immensity for such a significant purpose would have. It would be and feel incredible” – and that it did. I imagined Christmas Eve mass at Vatican City would be on a similar scale as the duration of Papal Conclave; the time during which the College of Cardinals takes to choose a new Pope and thousands of people and reporters anxiously await the verdict in St. Peters Square (as depicted in the movie based on Dan Brown’s book Angels and Demons). Christmas in Rome. Three things stood out to me. There were Christmas trees all over the city; in front of the Colosseum, in the centre of Piazza Vittorio Emmanuelle II’s roundabout and in the middle of St. Peters Square, those are just the ones I saw. As well as the presence of nativity scenes in various public spaces; at the top of the Spanish Steps, the middle of St. Peters Square and in St. Peters Basilica, to name a few, as well as inside nearly all of the churches in Rome. Secondly, the flurry of last minute shopping in the area surrounding Piazza Spagna. I didn’t realise that this area housed the major shopping district of Rome as well as all of the high end brands. It was a sight to see business men carrying fistfuls of cord handled designer paper bags walking swiftly in groups, evidently last minute christmas shopping for their partners, spouses and families on the afternoon of December 24th. Thirdly of course were the mass services, one on Christmas Eve and then another on Christmas Day, both held my Pope Francesco. On the 23rd I wandered over to St. Peters Square to collect my ticket to mass from the Bronze door on the right hand side of St. Peters Square. Unfortunately upon arrival I was told that I would first have to pass through security in order to reach this point – which meant I would have to join the que wrapping itself around the circular edge of the square. Looking at it I decided that I couldn’t be bothered and would make the effort to get up and return early in the morning…45 minutes later I was finally reaching the security barrier (don’t ask how, somehow I found myself standing in the que even though I didn’t want to). Two minutes later I had my ticket handed to be my a Swiss Guard and there I was, ticket in hand ready for tomorrow night. Of course after spending so long in the que I did go inside the Basilica, couldn’t justify not going in. Mass was due to start at 9:30 but we had been advised to be there by 7pm to ensure that we attain a seat inside the Basilica. Arriving at the square I was astounded by the size of the que! The que not only wrapped around the edge of the square (that is really a circle) but wrapped all the way to the start again before beginning to snake its way backwards. Nothing moved until 7pm when we saw people start being allowed in in small allotments. People rushed and nuns ran, you could see their head dresses streak across the front steps of the Basilica, clearly visible from the square. The cue although extensive moved rapidly and amazingly I was inside by 8:25ish! I couldn’t believe there were still seats in front of the altar. All of the seats closest to the central aisle and towards the front were full but there were still quite a few in the central section towards the back. We were seated! Now to wait for the service to begin. Preceded by the rosary in Latin were was an announcement to remind the people to refrain from applause as the Pope entered the Basilica. Priests began filing down the central aisle, two at a time. The hats grew taller and the procession thicker as the Pope got closer. People were standing on chairs andcraning their necks, squished towards the central aisle all trying to catch a glimpse of him. There were so many cameras and all of a sudden they started clicking as his unmistakeable hat walked down the central aisle in the centre behind the procession of priests followed by several men in black suits who could only be Swiss Guard. After a few minutes of photo taking (Which I was initially quite frustrated about but didn’t mind once it settled – it is understandable, it is the Pope! and I didn’t feel so bad taking a few photos after watching for a few minutes as nearly everyone else did so) the crowd settled as a hush and sense of calm spread over the building. The pope sat at the centre in front of the altar, accompanied on both sides by several other priests who were to help him with the ceremony. The readings were done by others before the pope himself began to speak. Theceremony was mostly in Latin but often the Pope would speak in Italian. His homily was entirely in Italian which I appreciated as I barely understand Latin. Hearing his voice was empowering. Every time we prayed and I would open my eyes after having them shut I would be dazzled by the room. The Basilica, easily the most exquisite church in the entire world makes you feel like you are looking at the heavens. When told to look to the heavens in prayer I felt like I was literally looking at heaven due to the beauty of the scene surrounding me. The people fell away in my mind as I enjoyed the ceremony. So many people together gathered to celebrate the birth of christ, the origins of Christmas. The Responsorial Psalms were said in a variety of languages; English, French, German and Chinese, each by a native speaker. It sounded incredible and bought home the grandeur of the celebratory event. Eucharist was a long affair. The blessing took a long time, and then to receive it was a slight challenge but very worth it. To receive the host blessed by the Pope, well that is an experience I will always treasure. Priests filed down the aisles spreading out throughout the church to cater to the 2000+ congregation. We awkwardly and carefully shuffled passed each other as we edged towards the priest and then back to our seats. At the end of the mass the Pope returned back down the aisle and the flurry ofpeople surged back towards the centre. People who had been at the centre incredibly moved away letting those who hadn’tbeen get a closer look. We caught a glimpse of the pope as we carried the baby Jesus to the nativity scene at the back of the church. Placing the baby Jesus in the crib he followed the procession back to the other side of the church before disappearing from view. 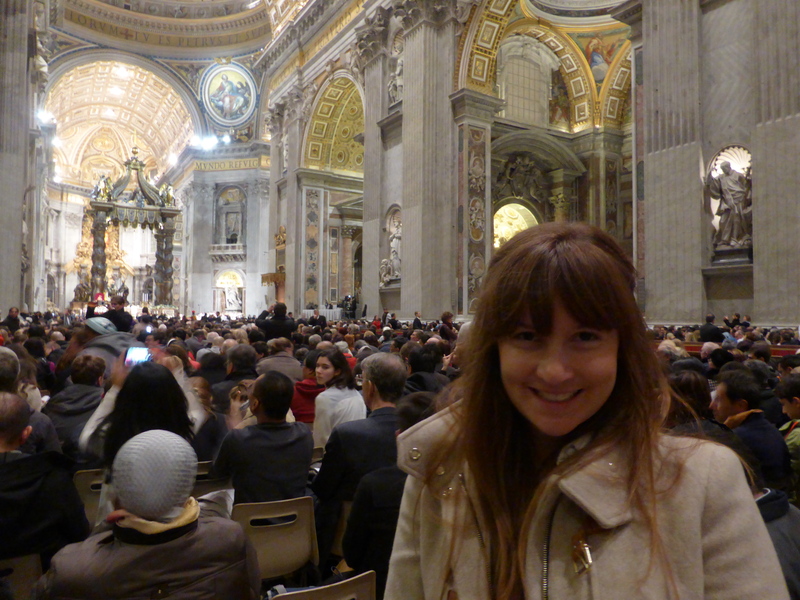 The doors opened and we were let out onto the front balcony of St. Peter’s Basilica. First going to look at the baby Jesus in the crib we all made our way out. The view was incredible! Standing in prince position out the front of the Basilica looking out onto a full St. Peter’s square was a sight I will never forget. It was magnificent! Vatican tape separated us from the general public standing in the square and so we proceeded down the side back towards the square…until the tape was cut. The populace from the Basilica was now able to step forwards into the empty space in front of the Basilica. A few people who had already moved down the side jumped the fence and slipped back through onto the steps. Slipping past the now open gateway that let these people out of the Basilica I can say standing there in front of the Basilica and the crowd in the square was remarkable! People were hovering around waiting for something. Chanting began and everyone had their eyes turned towards the balcony hoping for the Pope to make an appearance. Unfortunately he didn’t, that we heard, he was saving for tomorrow, the Christmas day service. With a smile plastered to my face and feeling full of joy, love, and warmth, with an accompanying sense of happiness and satisfaction I walked back through Rome to my BnB to Skype my family and open my cards on what was now in Italy nearly Christmas Day and what was in Australia Christmas Morning. I’m a huge atheist but this still looks superbly amazing! Just on a cultural level it’s amazing without adding the spiritual/religious angle. fantastic photos of the Basilica.